Nusrat Fateh Ali Khan’s classic track Mere Rashke Qamar has been recreated for the upcoming film Baadshaho. The makers of the film have dropped the film online and features romance between Ajay Devgn and Ileana D’Cruz. The soulful song is sung by Rahat Fateh Ali Khan, penned by Manoj Muntashir and recreated by Tanishk Bagchi. The original song Mere Rashke Qamar was a qawali sung and composed by the legendary singer Nusrat Fatah Ali Khan which had a length of about 15 minutes but the song has been reprised in just 3 and a half minutes. The film Baadshaho is an action thriller film which is directed by Milan Luthria and is written by Rajat Arora. Baadshao also stars Emraan Hashmi and Sanjay Mishra and will be released in theatres on September 1, 2017. The video of the song looks impressive with some intense romance brewing between Ileana and the handsome Ajay Devgn. 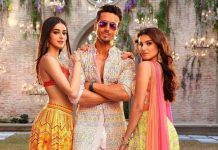 The entire sound track of the film will be released by the label T-Series. The film will also mark the fourth collaboration between Ajay and director Milan after Kachche Dhaage, Chori Chori and Once Upon a Time in Mumbai. The film was earlier scheduled to be released on January 26, 2017 but the producers decided not to release as the films Raees and Kaabil were also releasing in the same month.